C.Jane.Do: Tidbit Tuesday :: Garage Sale Season! Well, Spring is sprung and the weather has been so amazing this year! It always amazes me how the nicer the weather, the more people who head out to the mall... I guess it's because people are itching to get at the new spring fashions. For me, It makes me want to do more projects around the house and plant things outside! I'm still whittling away at taxes (seriously - are they done yet? I've been trying to get them done for weeks now!) so I apologyze for not having anything cool to show you lately. But, look forward to some DIY's to come! I'm getting a few ready and am excited to share soon! So, nice weather makes people want to shop! I have to say, I'm guilty as well for passing up being out in the sun and heading to the stores. Lately I have been tending to look more and more at the 'used' items with the new apartment. The good news is garage sales are just around the corner – I can't wait to see what you all have to get rid of! 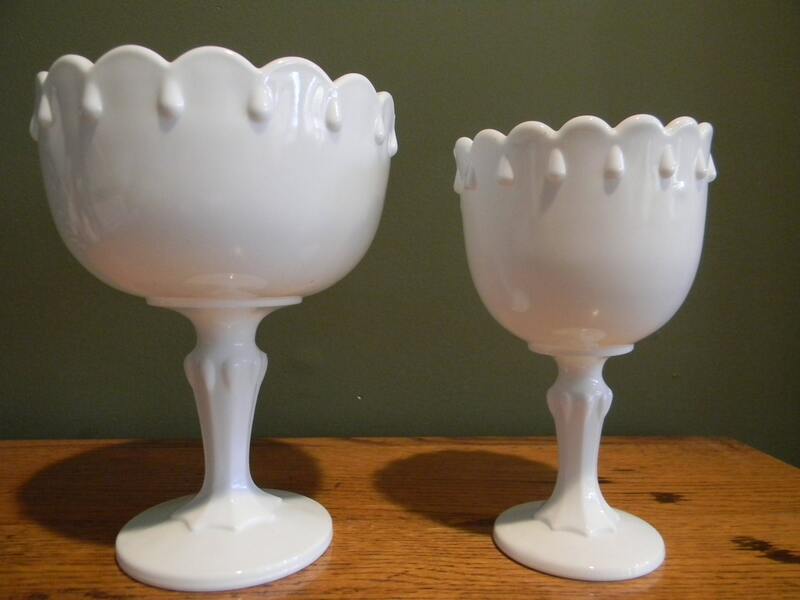 Here's one of my favorite versions of milk glass that I've been eying. No luck on that yet. I have a project where I need cheap, but quality wood frames. Last week I had a lot of luck at St. Vinnie's with frames. My ultimate favorite places to shop? Craigslist and Ebay. You can get to more of what you actually want so quickly instead of trekking around to 500 garage sales across town. Before I moved and down-sized, I sold a lot of things that I didn't need or have room for on Ebay. With the money I made, I spent my earnings on Craigslist. It's nice because you can go and check out the merchandise before committing, plus, no shipping! I redid my dresser set in college - it was one of my first DIY's! Today is on of my favorite 'finds'. I love how unique it is, haven't seen one like this before... In my old age I keep liking bling more and more, so I try to add it as an accent whenever possible: It's my headboard. It's chrome, silver, shiny, and has these awesome crystal ball embellishments on the tops that reflect the light. It kind of blocks my window corners a bit, but I fell in love with this as soon as I found it! I also love it's simple classic style and it will definitely be my style for when I finally have my own house! This is what sold me on this headboard.